There's only on airport in Amsterdam: Amsterdam Airport Schiphol (SKIP-hole), airport code AMS. By passengers, it's the fourth biggest hub in Europe. If you only count international passengers, it's even the third busiest in the world, since Amsterdam International Airport has been focusing especially on it's function as an efficient international hub. Amsterdam Airport has a reputation as one of the best organized European airports. This page informs you about the basics. But Schiphol Airport Amsterdam has a long list of facilities including some well kept secrets  a list is on our other Amsterdam International Airport page. Also read our tips how to find cheap flights to Amsterdam. The main hall (terminal) is called Schiphol Plaza. Taxis and cars (short parking) stop right in front of it, and the train station is right underneath it. From Schiphol Plaza, you can walk on the same level into Arrivals 1, 2 and 3. Departures 1 to 4 are one level higher. Click here for an interactive Amsterdam airport map (PDF). 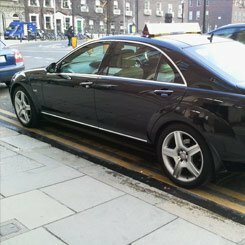 For the details, read our separate page about Amsterdam airport transfers. But to summarize, the train is quickest and cheapest as trains stop right below Schiphol's main hall, and they take just 15-25 minutes to the Amsterdam city center for around 4. Second in price come hotel shuttles. Connexxion runs a shuttle service between the airport and most Amsterdam hotels. The price is 12 (one-way) or 19 (return). A taxi ride takes some 25 minutes and costs around 45. But don't use either during the rush hours (7-10am and 4-7pm). Needless to say, all major car rental companies are present at Schiphol Airport - but a car isn't very convenient in central Amsterdam due to traffic jams and expensive parking. The left luggage hall is located in the basement between Arrivals 1 and 2, and is open from 6am to 10.45pm. Luggage can be stored for up to a week there. Shopping is divided between the Schiphol Plaza shops, which are before passport control and are accessible for everyone each day from 7am to 10pm, and the See Buy Fly shops which are tax-free shops located behind passport control (only for passengers). These shops are open daily, from one hour before the first flight departs until 30 minutes before departure of the last flight. If you are traveling within the EU and spend at least 20 euros, you can also leave your bought goods at the shop, and pick them up on return at no charge (within 30 days of purchase). The Pick-Up-On-Return point is at the Kelderplein, one level down Schiphol Plaza between Arrivals 1 and 2 (open 24 hours/day). Dakotas Restaurant, above Departure 1 (before passport control), is decorated in classical 1950s style around the legendary Dakota airplane. The food is good, too. Grand Café Het Paleis (The Palace) at Lounge 1 (after passport control) means waiting in style. Its designed after a real existing Amsterdam palace (Volksvlijt), with fans, high ceilings and a lot of wood. Theres a terrace. Café Amsterdam at Lounge 2 (after passport control) comes closest to a typical Amsterdam brown café. This also goes for Café Rembrandt, which is at Arrivals 1 (before passport control). Here are some tips for if you have a few hours to cross. The outside Panorama Terrace (before passport control, so not accessible for transfer passengers) gives a great overview over a part of the airport, including several piers and a runway. Which runways are used, depends on the wind direction, however. 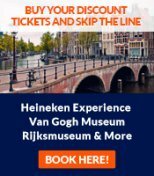 My other favorite is the unique permanent exhibition of the Rijksmuseum (the Netherlands national museum thats specializing in 17th century Dutch Master paintings) at the airport. This exhibition is unique in the world, and shows some. Its behind passport control, between the E and F pier, and thus only accessible for passengers. Admission is free. There are over 20 hotels in the direct vicinity of the airport. The following hotels get consistently good customer reviews: Sheraton Amsterdam Airport Hotel (right outside the airports terminal, with its own corridor to it), CitizenM Amsterdam Airport (an original choice), NH Schiphol Hotel and the Radisson Sas Amsterdam Airport. Visit easytobook.com to find and book any hotels near the airport. For transfer passengers, there are even two hotels behind passport control: Hotel Mercure Schiphol and the new Yotel, which also rents out their small but economical rooms by the hour to passengers for a short rest. Current flight information (including delays) is on the Amsterdam Schiphol Airports website. You can also get this information (as well as other information) by phoning +31-(0)900-0141 (0.40 euro/min in the Netherlands).